This Saturday sees Matchroom again offer a glimpse into the future as several touted prospects take to the ring at the 02 Arena in London. Sky Sports televise from 7:30pm. The original main event was slated to be Dillian Whyte v Mariusz Wach in a Heavyweight contest. This fell by the wayside when Whyte was injured in training. The show goes ahead, and it’s now really a glorified version of the new NXTGEN series that have recently been launched. Top of the bill sees fan friendly ticket seller, Frank Buglioni, from Enfield, defending the British Light Heavyweight Title he won last December in a fight of the year contender against Hosea Burton. Injury postponed a proposed defence at Wembley Stadium on the Joshua v Klitschko bill, but now he tops the bill in his own right against Tipton’s unheralded, and unbeaten Ricky Summers. 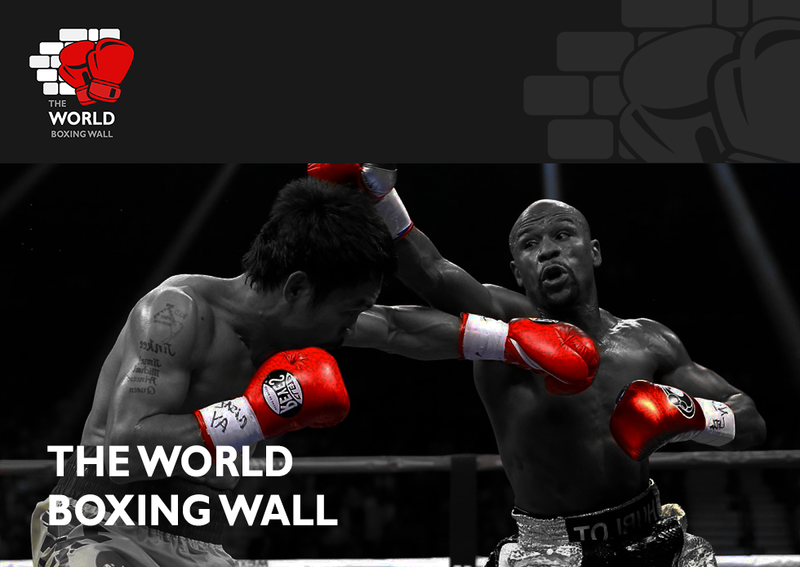 Here I preview the main event, and detail the talent on the undercard. 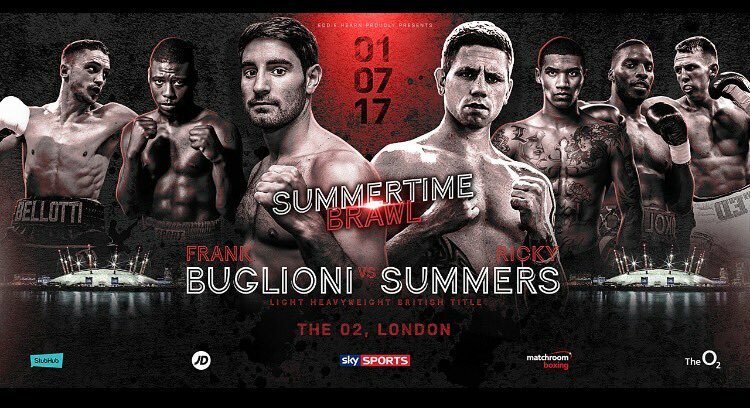 Frank Buglioni finally ends a near seven month wait on Saturday to make his first defence of the British Light Heavyweight Title when he takes on Midlander Ricky Summers at the 02. Buglioni acquired the Title in December 2016, in a barnburner against Hosea Burton in Manchester on the Anthony Joshua v Eric Molina bill. Behind on the cards, Buglioni found a right hand over the top that floored Burton and left him too unsteady to continue, and the fight was waved off. There were plans in the works for a rematch in April at Wembley Stadium, but the fight was shelved early on, and Buglioni has endured a frustrating time since his victory last year with two first defences against Summers postponed due to a cut sustained in sparring and a cancellation of a proposed June 3 card. Buglioni turned professional at Wembley Arena under promoter Frank Warren in November 2011, with a stoppage with over Sabie Monteith, and was quickly a massive ticket seller, bring an army of fans with him wherever he boxed. After yen straight wins, Buglioni picked up the WBO European Super Middlweight Title with an eighth round stoppage against Stepan Horvath, at the Copper Box Arena. After a first defence, fifth round knockout with over Gaetano Nespro, disaster struck in Buglioni’s next fight. Sergey Khomitsky, the Belarussian who effectively ended Jamie Moore’s career, bought a 28-10-2 record to London, but spectacularly stopped Buglioni in six rounds at the Copper Box in April 2014. Buglioni rebuilt, picking up the Southern Area Title, stopping Sam Couzens in four at the York Hall. Three straight wins followed before Lee “Banjo” Markham held him to a draw in a thrilling fight at Wembley Arena. He then beat Fernando Castaneda in five to pick up a ranking with the WBA. This immediately catapulted him into contesting the WBA Super Middleweight Title in September 2015 against decent operator Fedor Chudinov. Chudinov proved to be too much too soon for Buglioni, and he was comprehensively beaten on points by the Russian. This time the comeback was at Light Heavyweight, and after a routine win against Olegs Fedotovs, he then successfully challenged Hosea Burton to win the British Title. Buglioni has talked a lot in the buildup of facing Nathan Cleverly for the WBA Light Heavyweight Title. He and trainer Don Charles are also confident of beating the Welsh two weight World Champion. I feel this is slightly premature, and I would like “The Wise Guy” to clean up domestically before making another assault on the World stage. There is also a danger of looking past Ricky Summers ahead of Saturdays bout. Tipton based Summers has never fought outside the West Midlands, and makes the giant leap in both class and venue size to meet Buglioni on Saturday night. Also, rather alarmingly, he has never fought anyone with a winning record in his thirteen fight career, and certainly no one even approaching British Title level. Summers is ranked at 8th by Boxrec at British level, and that looks generous. He has beaten tried and tested journeymen in Jody Meikle on his debut (W PTS) Kiril Psonko (W TKO) Mitch Mitchell (PTS) and, in his last fight, the 20-73-5 trial horse, Remijigus Ziausys (W PTS). His best win on paper came against the then 7-7 Chris Nixon, stopping him inside three rounds. So it’s safe to say that Saturday night’s meeting with Buglioni represents a massive step up for Summers. It will be interesting to see whether he has been a well-kept secret or will wilt under the pressure of fighting in a massive venue like the 02 Arena. My pick is for Buglioni to grind Summers down and halt him just after the halfway mark. The main focus of hype on the undercard, is the debut of 2016 Olympic Bronze Medalist, Joshua Buatsi. He meets Carlos Mena over six rounds at Light Heavyweight. Ted Cheeseman (8-0) meets Matthew Ryan (14-1) for the English Super Welterweight Title. Reece Bellotti (9-0) and Jamie Speight (15-11) contest the WBC International Silver Featherweight Title. Laurence Okolie (3-0), Conor Benn (6-0), Isaac Chamberlain (7-0) and Craig Richards (8-0) are all on the card, while Jamie Cox (22-0) also gets a run out following his inclusion in the Super Middlweight Muhammad Ali Trophy.